GROUND ZERO — A New Jersey teen who lost her father on 9/11 got the rare privilege Thursday of meeting the President — but she really wants to meet Justin Bieber. So a few months ago, Payton Wall, 14, of Rumson, wrote to President Barack Obama, asking the leader of the free world for help in meeting the teenage Canadian pop prince. "Justin Bieber inspired me to share my story," said the beaming teen, who met the president at Ground Zero Thursday. After laying down a wreath of red, white and blue flowers near Survivor Tree at the Trade Center site, Obama warmly embraced Payton. Justin Bieber visits 'Late Show With David Letterman' at the Ed Sullivan Theater on Jan. 31, 2011 in New York City. 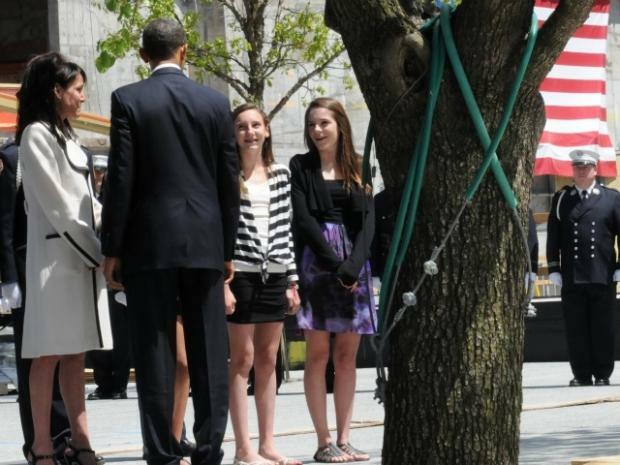 Her younger sister, Avery, 12, and mom, Diane, were also at the ceremony and met Obama. "He said it was an honor to meet us. He's really cool," said Avery. Her father, Glen Wall, was a partner at Cantor Fitzgerald when a plane struck Tower 1 nearly 10 years ago. He was 38 when he died.